In the last few years, I have found myself favoring Abraham Lincoln's Second Inaugural over the Gettysburg Address as my "favorite" Lincoln speech, or perhaps the one I thought had the most meaning, but as I have recently read and re-read the Gettysburg Address, I am not so certain. I do not know why my appreciation for this speech has grown, but it seems to be doing so. The concluding concepts of a "new birth of freedom" and "government of, by and for the people" really strike a chord with me right now. Perhaps I can learn to accept that neither speech is better/more meaningful/more important than the other and just appreciate both at the same level. Not everything has to be better or worse than everything else. 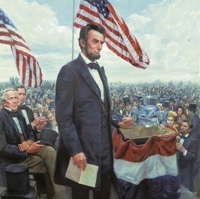 Both are remarkable addresses, but since today is the anniversary of the remarks in that small Pennsylvania town, I will reprint those words, from the Bliss copy as on Abrahamlincolnonline.org.